At ShelterBox Canada we have plenty of resources to get you started in raising funds and awareness! Here you can find video content, social links, pre-written case-studies and beneficiary stories for your club newsletters as well as access to exclusive ShelterBox training resources! We have plenty of print materials in our head office in Toronto, Ontario – if you would like us to send you any resources or are looking for a specific resource and are unable to find it, please use the form at the bottom of the page to get in touch! Looking for single page content to paste into your mail, email or website communications? We’ve got it covered! Perfect for inclusion into monthly newsletters, or to read and share at a meeting. The more who know about ShelterBox, the more families we can reach in the aftermath of disaster. Here are our current downloads of informative articles, interviews and stories about the people we help, the places we go and the people who make it all possible. If your Rotary Club or District would like to share information about ShelterBox on your website or Club Runner please feel free to use images from our site and the pre-written content below or any of the one pagers listed above. ShelterBox is an international disaster relief organization and Rotary Project Partner. ShelterBox is made up of people who believe in shelter as a human right – that shelter from the chaos of disaster and conflict is vital. When people are plunged into crisis, normality is suspended. But good, quality shelter can cut through the chaos. This is why they provide the tools that enable people to rebuild homes and transform their lives. 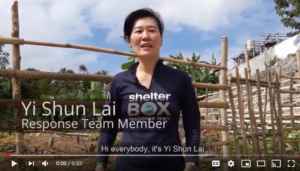 Check out and share the latest ShelterBox videos on our youtube channel. Here our some of our favourites! Looking from some printed materials to make your event extra special? Let us know!